"For readers of Neil Gaiman, Margaret Atwood, China Miéville, and David Mitchell comes a striking debut novel by a storyteller of keen insight and captivating imagination. Named one of the best books of the year by the Washington Post & a Lambda Literary Award winner. On a cool evening in Kolkata, India, beneath a full moon, as the whirling rhythms of traveling musicians fill the night, college professor Alok encounters a mysterious stranger with a bizarre confession and an extraordinary story. Tantalized by the man’s unfinished tale, Alok will do anything to hear its completion so he agrees to transcribe a collection of battered notebooks, weathered parchments, and once-living skins. From these documents, spills the chronicle of a race of people more than human, ruled by instincts and desires ages-old. The tale features a rough wanderer in 17th century India who finds himself irrevocably drawn to a defiant woman—and destined to be torn asunder by two clashing worlds. With every chapter of beauty and brutality, Alok’s interest in the stranger grows and evolves into something darker and more urgent. 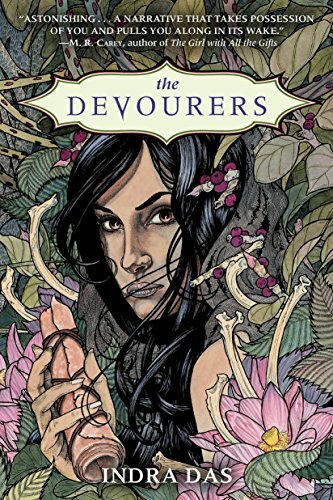 Shifting dreamlike between present and past with intoxicating language, visceral action, compelling characters, and stark emotion, The Devourers offers a reading experience quite unlike any other novel."